At 893 m, Cross Fell is the highest point in the Pennine hills of Northern England. It is also the highest point in England apart from the main Lake District peaks. The summit is a stony plateau being part of a 20 km long ridge running North West to South East, which also incorporates Little Dun Fell (842 m) and Great Dun Fell (849 m). The three adjoining fells form an escarpment that rises steeply above the Eden Valley on its south western side and drops off more gently on its north eastern side towards the South Tyne and Tees Valleys. 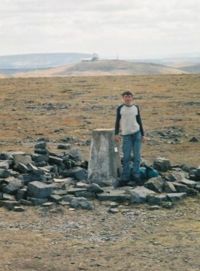 Cross Fell summit is crowned by a cross-shaped dry-stone shelter, though this is not the reason for the naming of the hill. On a clear day there are excellent views from the summit across the Eden Valley to the mountains of the Lake District. On the northern side of Cross Fell there are also fine views across the Solway Firth to the Southern Uplands of Scotland. The fell is prone to dense hill fog and fierce winds. A shrieking noise induced by the Helm Wind (see below) is a characteristic of the locality. It can be an inhospitable place for much of the year. In ancient times it was known as "Fiends Fell" and believed to be the haunt of evil spirits. It has been speculated that this last feature may be why the fell became known as Cross Fell ('cross' = 'angry'). Another theory is that at some time a cross was placed at the summit in order to ward off the spirits. But the origin of the name is not known for sure. A conspicuous local feature is the golf ball shaped radar installation on the summit of Great Dun Fell. This was built in the 1960s and serves to support civil air traffic control over the North Atlantic. Cross Fell and the adjoining fells are mainly comprised of a bed of hard, carboniferous limestone. Where this bed surfaces, there are steep rock faces. There are also strata of shale and gritstone that surface on the fell. On the south and west facing slopes of Cross Fell the rock faces have been broken up by frost action to give a scree slope made up of large boulders. The local terrain shows obvious evidence of recent glaciation and is covered by thin soil and acidic peat. Cross Fell, Great Dun Fell and Little Dun Fell form a block of high terrain which is all over 800 m in altitude. This is the largest block of high ground in England and it is snow-covered for much of the year. Snow can be found in gullies on the north side of Cross Fell as late as May in most years. 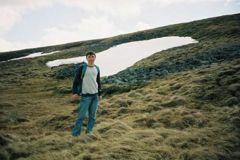 In some years, lying snow has been known to persist until July and fresh snowfall in June (mid-summer in the Northern Hemisphere) is common. Precipitation on Cross Fell averages around 280 cm per year. Local flora includes a number of rare alpine plants such as the Starry Saxifrage and a mountain Forget-me-not. 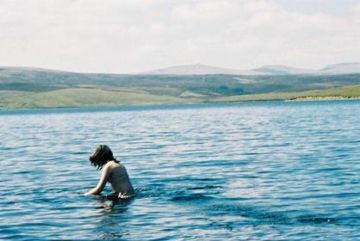 Cross Fell is covered by what is known as "siliceous alpine and boreal grassland". It is the southernmost outlier of this vegetation type, which is common to highlands in Scotland and Scandinavia. It is a designated Special Area of Conservation (SAC). Local farmers are required to keep free-roaming sheep off the tops of the fells in order to avoid damaging the natural flora. The Helm Wind is a local phenomenon. An east wind causes air to rise slowly to the summit of the ridge and cool as it does so. At the summit, the dense, cool air drops rapidly down the steep western slope (causing the Helm Wind) and forces warmer ambient air to rise. Moisture in the ambient air condenses to form the Helm Bar — a stationary handle of thin cloud running along and outwards from the edge of the summit. The Helm Wind can be very strong where it is channelled down gullies in the side of the escarpment. It is experienced particularly in the villages of Milburn and Kirkland. A similar feature can be found around Table Mountain near Cape Town, South Africa, with the local equivalent of the Helm Bar being known as the Table Cloth. Cross Fell is crossed by the Pennine Way footpath en route from Dufton to Alston. 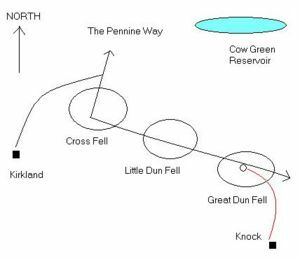 Thus it may be climbed either from Dufton to the south east, or from Garrigill to the north west simply by following the Way. This section of the Way is well signposted and laid out. Some parts of the path are surfaced with stone slabs. The summit is about 12 km from either village. The easiest route to Cross Fell summit (around 6 km each way) is via a road from the village of Knock. This is a well graded, tarmac road which provides car access to the radar installation on Great Dun Fell and a quarry nearby. Great Dun Fell is the highest point in the British road system. Although most of the road is private, little effort is made to prevent access to the general public and it is possible to drive a normal car almost up to the summit of Great Dun Fell, where the road meets the route of the Pennine Way. It is a relatively easy walk from this point along the summit ridge to Cross Fell. However, there is a very boggy area separating Little Dun Fell and Cross Fell, and the correct route between the two is marked by a tall cairn situated at the edge of Cross Fell and several hundred metres back from the ridge. An interesting route to the summit is from the village of Kirkland. The walker can park his/her car by the side of the road going north out of the village and follow a track going past a group of holiday cottages and rising up to some ancient mine workings. A track leads from that point towards the west flank of Cross Fell. A direct approach to the summit from the west involves climbing a difficult scree slope, so an easier way is to follow the track (not well defined over its whole length) around to the north side of the fell, where it meets the Pennine Way at a cairn. One may then follow the Way up a gentle slope to the summit. This route offers fine views (up to 100 km on a clear day) over both the Solway to the north and the Eden Valley to the south. In fair conditions, the walk from Kirkland to the summit takes about 2 to 3 hours. An ascent of Cross Fell in anything but perfect weather conditions can become challenging. None of the available routes offers a well defined path all the way to the summit. To the north of the ridge lies an extensive area of featureless bog and moorland, without obvious contours. The immediate area around Cross Fell is prone to hill fog and low cloud. Above 500 metres, visibility can suddenly drop to almost nil. It is easy to become disoriented and lost. The scree slopes on the edges of Cross Fell can be treacherous in conditions of snow or ice. The large boulders are not securely seated and move readily when a walker tries to cross them. It is easy to fall and break a limb. This particular line of approach to the summit is best avoided unless conditions are clear and dry. Increasing numbers of walkers have come into the area since the Pennine Way opened in the 1960s and as car ownership has become more widespread. After a number of fatalities among walkers in the locality, a mountain rescue team was established at nearby Penrith in 1959. This team is called out to rescue lost, disappeared or injured walkers in the Cross Fell area, on average about once every two weeks. That said, Cross Fell has much to offer the visitor. 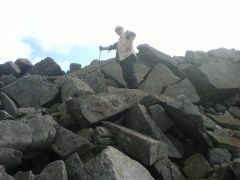 A climb to the summit is safe and easy so long as proper precautions are taken. The walker should be adequately dressed and equipped with map and compass. Most of the locality is within range of mobile phones. 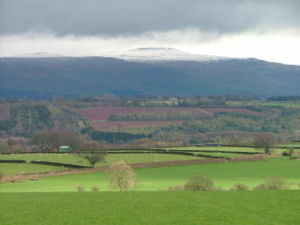 Cross Fell is a conspicuous feature in the landscape. It dominates the skyline on almost the entire 30-km length of the A66 trunk road between Penrith and Stainmore. It can also be seen from Helvellyn summit in the Lake District and from high ground throughout Dumfriesshire and Northumberland.